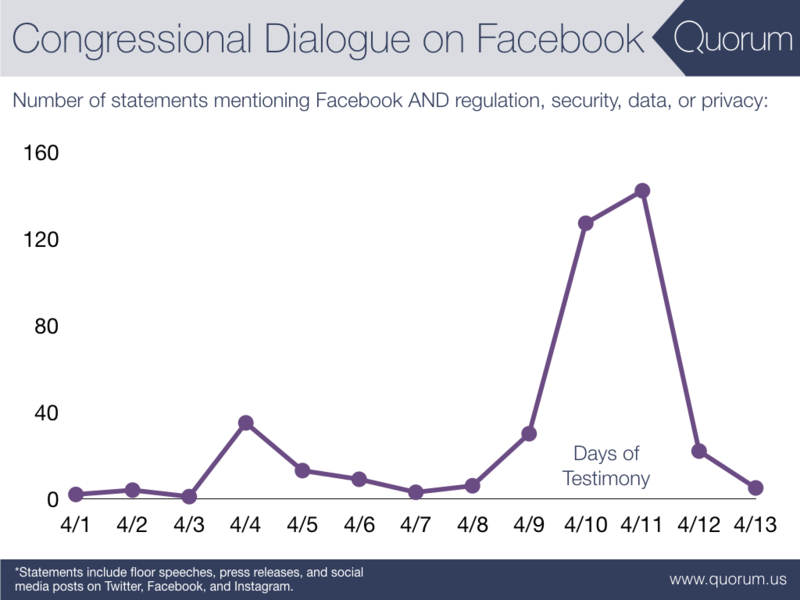 48 hours following the hearings, congressional dialogue about Facebook has already dropped off. In the nine days leading up to Zuckerberg's testimony, statements from Congress mentioning Facebook and regulation, security, data, or privacy were minimal. During the two days of testimony, there was a notable surge in dialogue including 127 statements on Tuesday and 142 on Wednesday. However, on Thursday only 22 statements were made by members of Congress on these same issues. As of Friday at 10:30 AM, only 2 statements had been made. Democrats have been slightly more vocal than Republicans on policy issues surrounding Facebook. 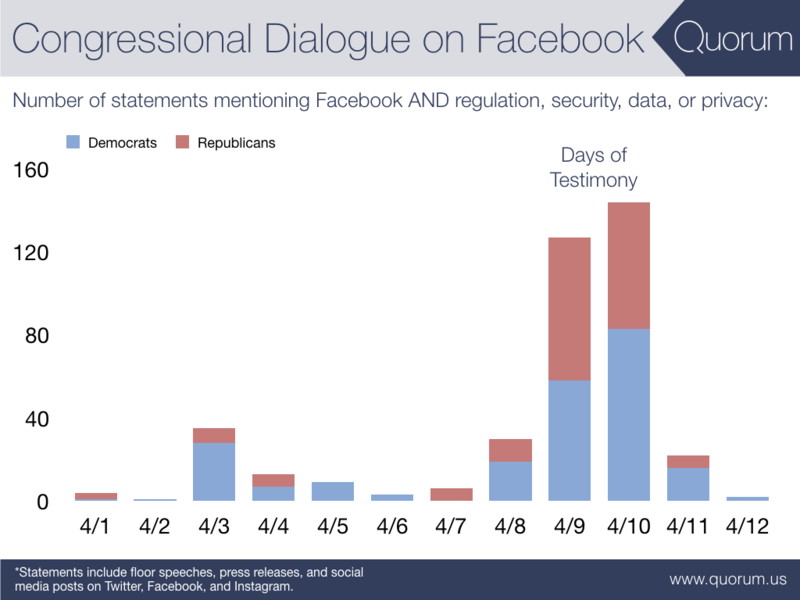 Over the past 12 days, Democrats have made 216 statements referencing Facebook compared to Republicans 169. On Tuesday, Republicans were slightly more vocal than Democrats with 69 statements to Democrats' 58 statements. On Wednesday, Democrats outpaced Republicans with 81 statements compared to 61 statements. Fun Fact: The average age of the committee members who questioned Zuckerberg is 61 and a half years old. In response to the hearings, several news outlets reported that the questions asked by committee members about Facebook and its business revealed a generational and technological divide between the lawmakers and Zuckerberg. 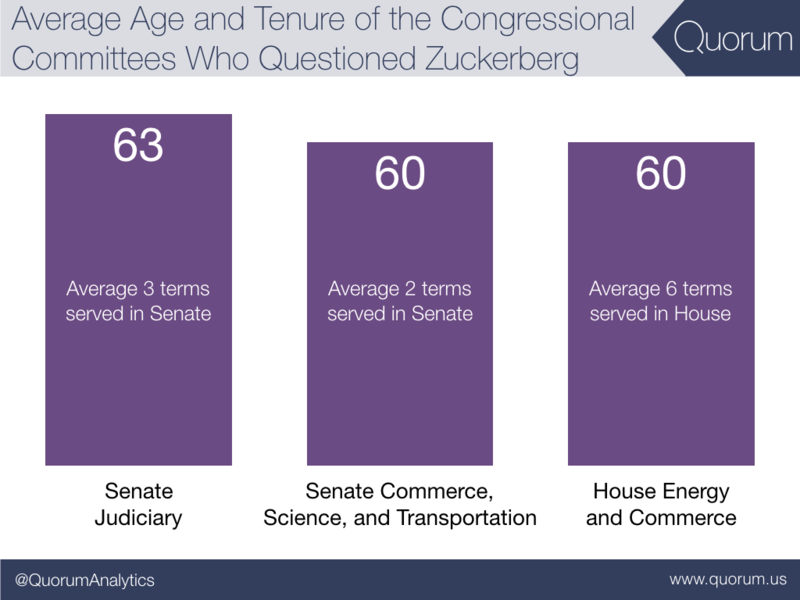 Across the three congressional committees who questioned the CEO, the average committee member is 61.5 years old—nearly double Zuckerberg's age.